127 mm/50 3rd Year Type3 х 2 pcs. 180 Degree Turn Time22.78 sec. Initial HE Shell Velocity915 m./s. Initial AP Shell Velocity915 m./s. 610 mm Quad2 х 4 pcs. 25 mm/60 Type96 mod. 14 х 1 pcs. 25 mm/60 Type96 Twin mod. 13 х 2 pcs. 25 mm/60 Type96 Triple mod. 15 х 3 pcs. 25 mm/60 Type96 Twin mod. 14 х 2 pcs. 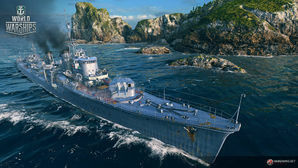 Yūgumo — Japanese Tier IX destroyer. Developed from the preceding Kagero-class destroyers, she carried more advanced main gun mounts and reinforced AA defenses.